The design for the Salmon Ponds hatchery was based on plans from the famous Stormontfield Ponds in Scotland. One of the original Tasmanian Salmon Commissioners, Mr Robert Read of Redlands, provided the land on which the hatchery was constructed at Plenty in 1862. Superintendent of the hatchery William Ramsbottom had accompanied three previously unsuccessful shipments of ova from England. When the 1864 shipment was received at Plenty, Ramsbottom and Morton Allport anxiously unpacked the consignment. A quantity of live ova was transferred to gravel beds in a small stream, ice was placed in the water to reduce the temperature and a tent erected to protect the ova from the sun. Ramsbottom’s dedication was rewarded with the emergence of the first live trout on 4 May 1864. It was also the location of the Salmon Ponds, on the banks of the Plenty River just above its junction with the Derwent River, that had much to do with the success. The site was isolated, fed by cold clear water from Lake St Clair, and connected to the sea. ‘The Ponds’ soon became a popular tourist attraction where the 19th century ideals of acclimatisation were clearly evident. The hatchery ponds were situated within ornamental gardens laid out with English trees. In earlier times the grounds had included an aviary with parrots, cockatoos and pheasants. Today, the buildings and grounds of the heritage hatchery still retain much of their original character. 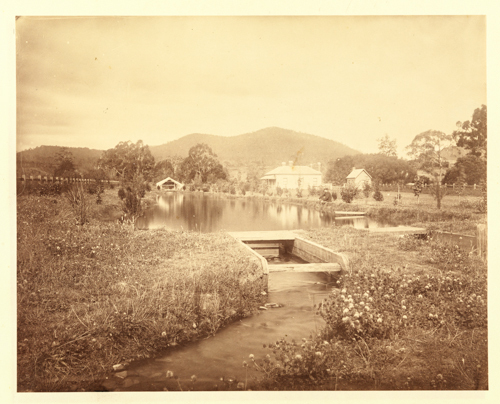 The Museum of Trout Fishing at Plenty acknowledges the significant historical role of the Salmon Ponds as the birthplace of trout propagation in Australia.